Every writer demands an audience. I could not fail to be aware that as soon I started discussing political issues in this blog, readership leapt to 600%. This puts me in a bit of quandary because this isn't a political blog per se; it's me sharing my world and my experiences with my friends around the world — especially those in the western hemisphere, whom I abandoned when I came east in search of (to put it simplistically) adventure. So, let's compromise. Today I'll talk about music; tomorrow I'll talk about red shirts, if I have time. Last weekend we staged a very unusual camp for some of the brightest kids in the country. It was wild. 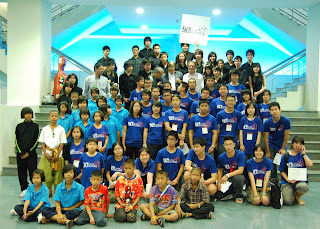 We slapped together a symphony orchestra in three days that could play real music, blew the minds of young science students by using that symphony orchestra to demonstrate principles of relativity and quantum theory, used film music to ilustrate the laws of physics, and had Thailand's ten-year-old champion paper plane folder lecture on aerodyamics. A jazz pianist taught improvisation to kids who had never touched an instrument, and an entire scene from Bruce Gaston's opera "A Boy and a Tiger" was staged. And amazingly, they had fun doing all this, thanks to their own imaginations and an incredible catering service that produced food every 90 minutes. At the final concert, Dr Yongyuth, former Minister of Science and Technology, told us that the camp was a fulfillment of one of his fondest dreams. It was exciting. The atmosphere all weekend was one of almost uncontrollable glee. And the final concert, including Mozart, Haydn, and a wild improvisation in which the audience ran onto the stage and screamed and danced about under the direction of Zion from the Patravadi Theatre, was such fun that I didn't want to go home.